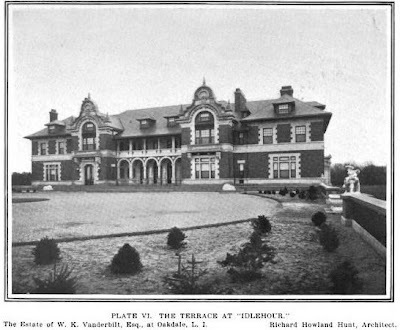 'Idle Hour', the William Kissam Vanderbilt estate designed by Richard Howland Hunt (of Hunt & Hunt) c. 1899 in Oakdale (with an addition by Warren & Wetmore c. 1902). 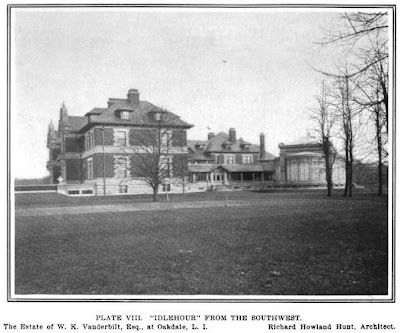 Vanderbilt first built his estate in Oakdale in 1878 as a hunting retreat but the house burned down in 1899 (the first was designed by Richard Morris Hunt). On the second go round the house was made to be 'fire proof', hence the thickness of the current version. 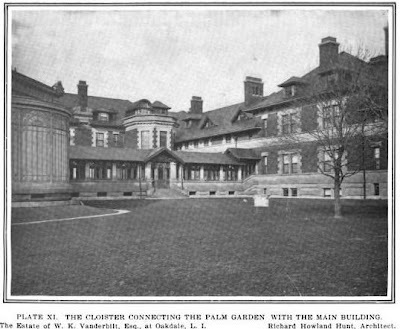 Today the house is part of Dowling College. 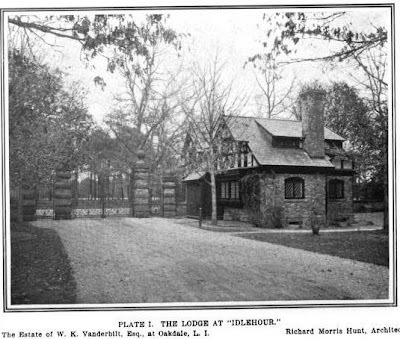 Click HERE for more on 'Idle Hour' and HERE to see the brochure from when 'Idle Hour' was for sale. 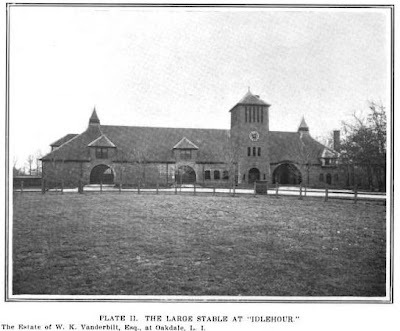 Click HERE to see 'Idle Hour' on google earth. What was WK thinking? 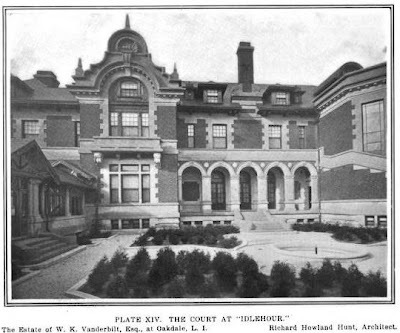 This is, to my mind, the most ungainly, unattractive "gilded age" mansion. I always thought that perhaps age and mature landscaping mellowed it, but your wonderful posting of the sales brochure when WK died depicts it as no less bulky and charmless than the day it was built. 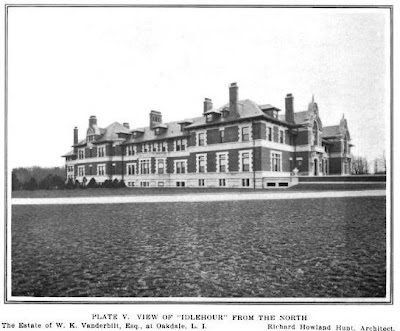 Interesting too that at almost the same time as WK was re-builing Idlehour to such ill effect, his ex-wife Alva, using the same architect who had served the Vanderbilts so well in the past, would construct Brookholt, her odd and ungainly Hempstead house. Perhaps Mr. Hunt was going through a bad period. His son seems to have regained momentum for the firm in Alva's Beacon Towers, so perhps we ought to forgive him. I have something like 19 interior shots too that I will post tomorrow and Friday. 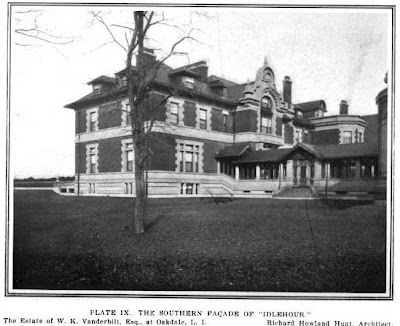 It's interesting to me how WKV invested so much money and time developing the first Idle Hour into the picturesque Stick-Style country home, that to replace it with something like this is, well, kinda weird. It's just... too much, and not a lot of good "much." Very unbalanced, top heavy. It seems to me that 90% of the exterior detail is in those enormous Dutch gables. I think it's just one of those houses where they tried, but didn't get it quite right. I'm sure it was an impressive sight because of its size and rambling nature, but, well... you all know. LOL, I can see that I'm late to this party, but indeed, I've always seen this place as sort of well built, ungainly hot mess of a house. Appropriately enough, it looks rather like a big railroad station. 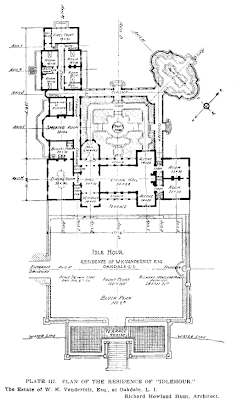 BTW, Magnus, WKV was NOT using the same architect, who had died a few years before, but his sons, who also designed Brookholt, and clearly were not the masters of form and planning that their father was. Although I do kinda like Beacon Towers...but it's also a well known fact that Alva was the one with the knowledge of architecture and taste, who drove all of WKV's projects while they were married. This Idlehour, as a post-divorce project, shows it. 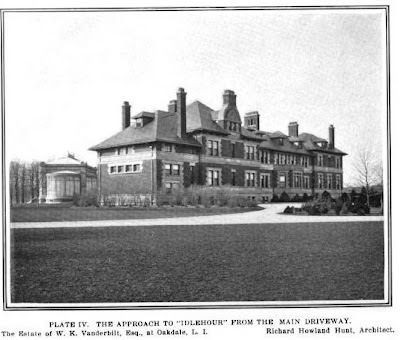 While I would concur that the RHH-designed Idle Hour suffered from being overworked, likely from the meddling of WKV, it wouldn't be the only Gilded Age mansion from a skilled architect to have that fate. I seem to recall that Delano and Aldrich were by no means fans of their own work with Oheka. Like Idle Hour it too was excessively bulky for that 'fire proof' requirement from the client. Big yes, not unlike Idle Hour, but devoid of the character D&A gave to most their projects. Hideous house. Such a mongrel, and very nearly a railway station in effect. Impossibly ugly. Right you are DED- I had forgotten that Hunt, Jr.had done both the 2nd Idlehour and Brookholt. But although Alva is widely credited for her taste in all things architectural, Brookholt is a strangely unappealing pastiche as well. Beacon Towers, as quirky as it may be is a personal favorite of mine, so I'm glad to believe that Alva and Hunt fils hit their stride after all. The college has a interesting site - http://www.dowling.edu/about/idlehour/ Top to bottom tour. Anon 6:10- great link. Odd, isn't it that despite it's vaunted "fireproof" construction, the "new" idlehour should have been devastated by a fire. Hints of the "unsinkable" Titanic. 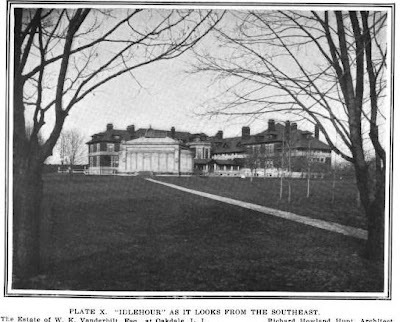 No doubt the place is well built, and the Tennis Court is one of the most documented from that era of "playhouses." I think we all are used to the flawlessness, or near-flawlessness, of most places featured on this site. Every once in a while we get to see that quirky house, eccentricity come to life, but nothing on the scale of Idle Hour II. I agree with whoever said that WKV had a hand in the design. This probably shows his personal taste, finally, after years of living in "Alva's houses." Not completely unfortunate looking, just... unrelated; to nature, the grounds, to life. see my comments in the second interiors post. and i hadn't even noticed the daylight basement and OMG - the stable is the most spectacular one i have seen on this site yet. i'm also pretty fond of the interior court and the cloisters leading to the palm house. i would think that by now you guys wouldn't get so overwhelmed by opulent extravagance. all these architects were trying to outdo each other on a scale never to be repeated (altho tapic samir's little medieval village is pretty outrageous). they knew the sky was the limit and that money was no object and they were going to spend as much of it as they could. so the really creative houses like this one, laurelton hall, belmont towers, wheatly, applegarth, etc came into being. no holds barred - no constraints - they didn't have to make the places look like everybody else's. so, if you aren't into outrageous and bizarre, then you're in the wrong blog. Worth noting, the gate lodge is now listed for sale. 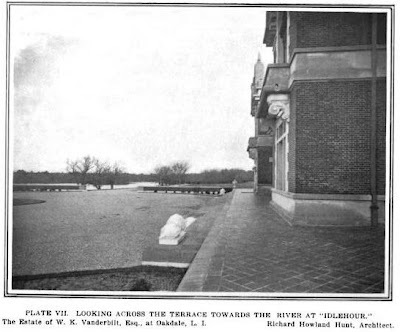 However a lot of that magical charm captured in the B&W photo posted at the top of this day's entry is sadly gone.